Feb 21, 2013 Some 70 people packed into the Commons, a meeting space on Atlantic Avenue in Brooklyn, to hear speakers Nick Mottern and Ann Wright, discuss drones - pilotless planes that are increasingly being used to wage war by the United States in many areas around the world. 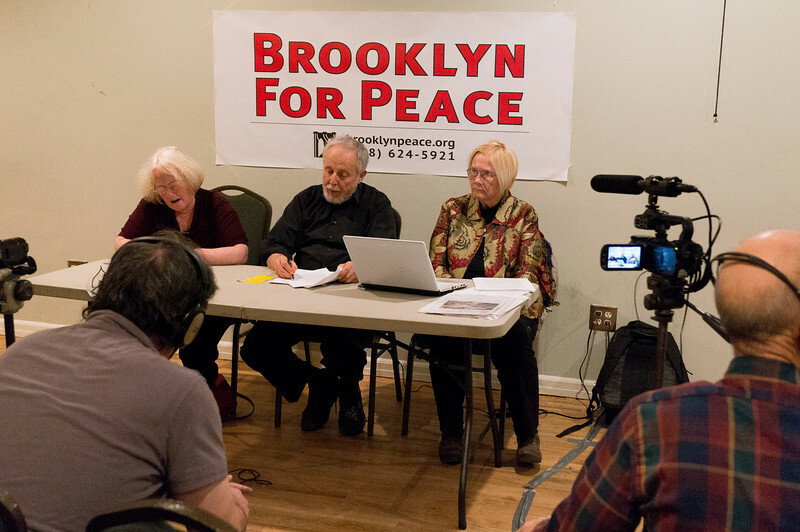 The forum was sponsored by Brooklyn For Peace and co-sponsored by Fort Greene Peace, the Green Party of Brooklyn, Peace Action Bay Ridge / Interfaith Peace Coalition and the NYC War Resisters League. Nick Mottern is an activist and retired journalist who is an expert on drones and has led demonstrations and protests using scale models of drones to educate people on the issues. He has a website, Know Drones, which is devoted to educating and opposing this ominous new technology that can be used to spy on people and to target people for assassination - war by remote control. Ann Wright is a former United States Army colonel and retired U.S. State Department official, known for her outspoken opposition to the Iraq War. She received the State Department Award for Heroism in 1997, after helping to evacuate several thousand people during the civil war in Sierra Leone. She is most noted for having been one of three State Department officials to publicly resign in direct protest of the 2003 Invasion of Iraq. (bio courtesy of Wikipedia). Ann Wright was part of a delegation that visited Pakistan in 2012 to solicit eyewitness accounts of the use of drones and the widespread harm to innocent civilians it has caused in that country. The forum was chaired by BFP's Co-Chair, Rusti Eisenberg who introduced the speakers and moderated the discussion that followed. Wright cited the statistics on drones - the number of civilians that have been killed, the number of drone attacks which has skyrocketed under the Obama administration and which have been deployed in more and more countries around the world under the rationale of fighting terrorism. Wright also pointed out the drones have become a huge business with the U.S. selling $1 billion to NATO allies last year. Mottern concentrated on the domestic use of drones which are beginning to proliferate in localities as police departments start to use them for surveillance. Drones are also being used by private companies but there is little or no regulation on a local or federal level to protect Americans from spying and the erosion of their right to privacy. A discussion followed the presentation with questions and comments from the audience. Brooklyn For Peace intends to continue its activism, educating and building opposition to this new, hi-tech form of warfare and targeted assassination. BFP Co-Chair Rusti Eisenberg (left) and forum speakers: Nick Mottern and Ann Wright at the BFP forum on drones.